I’ve just had to get more creative, let go of my snobby ideas and figure out how to work marvelous magic with budget priced items – and most of all, shop well. There are a few ways to work a nice piece of salmon or other pricey fish into your budget. Divide and Conquer: Use part of the fish as an entrée, and the other as a “mix” in for a less expensive meal – the result allows one to cost average the somewhat pricey fish over more than one meal. Utilize portion control – I often buy a large piece of salmon, cut out several nice pieces and use the scrappier ones in another dish for another meal. Shop during Sales: Especially during Lent, when the price of most fish hits rock bottom. Salmon, normally on sale for $6.99 to $7.99 a pound can drop by another dollar or two, as does most fish. Swap Out: Be flexible in the type of fish you’d like to use for a recipe – often one can swap out the expensive fish for the sales priced fish with spectacular results. 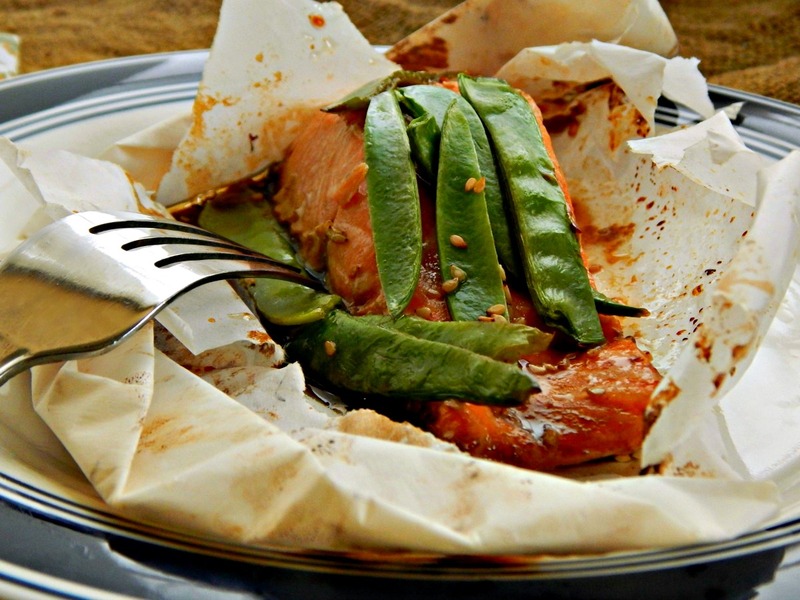 So tonight, enjoy a “Salmonchanted” Evening, a beautiful dish “en Papillote” with an Asian flair. Best of all, it can be prepared ahead, or even better, prepared with your guests. Kids love making these. Super easy, super fun and super quick! I’m using most of the above strategies in putting this fish on the table: I’ve shopped well and been smart with my Salmon. I’ve made the most of it by trimming the fillets, and using that bit of Salmon left over in another recipe, Salmon and Asparagus Hash. I’ll be sure to make up my budget with an inexpensive meal – most likely my Updated Vegetable Soup. The actual cost of the Salmon with the pea pods for this meal came to $4.90, with sides at $2.80 – so this elegant meal, although it comes in at only $7.70, is over the price of one of my $5.00 more or less, Bargain Meal of the Week posts. Taking the second recipe, Salmon Hash ($4.35) and my soup (under $3.00) I can cost average the three meals at about $5.00 a piece. Budget saved…see more about my strategies and pricing at the bottom of the post. I served these Asian style Salmon Packets with fresh asparagus and couscous. Had I gone with very low cost options like a simple rice pilaf and a budget vegetable like carrots, I could have shaved a bit of money off this meal and come in much closer to the $5.00 mark. One one side, close to center, place the filet. Top with 1/4 of the snow peas. Use one tablespoon each of Soy, wine or sherry and oils or oil, simply sprinkle over the top. I never measure the liquid, just drizzle it. I normally make this without honey, in the Japanese fashion – I have found over the years that many of my friends prefer a bit of sweetness, and so when serving some, I’ll drizzle just the faintest amount of honey over the top. Sprinkle sesame seeds over the top. Fold, using directions, below. Place on a rimmed baking sheet (just in case) and bake in a 475 degree oven for about 10 minutes. The packets are done as soon as the are puffed up and have begun to color a bit, so watch carefully. A slight variance in oven temperature will make a drastic difference in timing at this high temperature. Open packets right away or they will continue to cook. You can tear open, cut open or just put a slit in the middle of the packet with a knife. Be careful of hot steam escaping! Note: At 10 minutes, my oven turns out beautiful salmon, just cooked, still moist. If you like yours rare in the middle, I’d try out 8 minutes. This is a really fun project for kids in the kitchen! Now, it’s time to fold. Fold the parchment or foil in half, enclosing the fish – you can trim your parchment into a round or a heart, but I never get that fancy. Starting at the folded end, turn the edge over (it will make a small triangle) then holding that triangle in place, move over about an inch or so and make another fold. Continue around the fish, forming a packet. Tuck the end under. If for some reason, your tucked end won’t stay down (which happens sometimes) place a paper clip over it. If you don’t have a paper clip handy, just lay a butter knife over the end. Salmon: Really budget shop for your fish. My Salmon was bought for $4.99 a pound during Lent, but sometimes frozen fillets can be bought with a coupon. By taking the best of the Salmon, I was able to cut 4 small fillets and trim them to about 3 ounces and use the less desirable parts to make another meal. The piece of Salmon I was working with was about 1.2 pounds, the fillets came to 12 ounces and I had five ounces left over for another meal that uses Salmon more sparingly. Believe me, no one starves at my house, and I know I reveal just how cheap I am, but it is a strategy that works and allows me to eat “above budget.” I also serve plenty of healthy vegetables and sides. You might recognize this same strategy used in my Corned Beef Dinner post. This, basically, is how I saw my Grandmother cook back in the day, and my Mother. Sunday dinner was special, but then multiple spin offs came from it. There are no “I don’t like left overs” people at my house, and if they were, they’d be offered a peanut butter and jelly sandwich that they could get up from the table to make. Salmon: The total cost for the protein was about 6 dollars, but per meal, the cost averages around $3.00. For this meal, the actual is $3.74. Pea Pods: These are super expensive by the pound, but a few ounces are all you need – $4.49 a pound, I bought a small handful (a few per fillet) and paid 72 cents. Sauces: I never really count the cost of the sauces, they are so minimal. I buy small bottles with coupons during sales and often don’t pay anything for them. Sherry: I really shop the sales and speak to the employees – I find I can find great wines for a pittance. If you have a wine shop you like, I find you can get mailings or emails for their best sales – often in the fall and spring. My last bottle of a basic white was $2.99 – I know, I know, they say always buy a wine you’d drink to cook with, but you’d be surprised at the bargains you can get and how long you can use a bottle for quick little recipes like this. Sherry is a fortified wine and lasts forever – cost for this recipe is about 20 cents. Honey: Can be really pricey. I have a lovely friend who gives me honey she’s found on her travels for Christmas every year…I often have to fortify by honey bought at…strangely enough…Walgreens. They have coupons in their ads for honey when it is on sale,and those can often be combined with manufacturer coupons. Keep your honey lid clean so it doesn’t stick, and if your honey ever crystallizes, simply place the bottle in very hot water. Walgreens is the best pricing I’ve seen. A teaspoon, though, is nominal. Olive Oil: I have a little strategy for buying olive oil – using coupons and sales to lower the price, so click on the link. I think it’s important to use olive oil as opposed to many others – the health benefits outweigh a bit more extra cost, and it can be had at a very reasonable price. I also like the fact that Olive oil contains no hidden trans fats like Canola or Vegetable oil. Cost for this recipe: 24 cents. Sesame Seeds: This can be pricey, so look for them in the Asian section or an Asian Market – they come in a good sized jar, pretoasted and I keep mine in the freezer. Cost for a few light shakes was nominal. Parchment Paper: I haven’t paid for this for years, ever since Reynold’s wrap came out with their brand, and with coupons and sales it is often free. If you don’t have it, use foil, which is easier, by the way, although a little less impressive at the table. Other items: Couscous, Tomatoes and Asparagus…Couscous was about $1.10, Asparagus 95 cents, and the Tomatoes, just a few, around 75 cents, total $2.80. This entry was posted in Click here for Bargain Meals, Click here for Fabulous Food Posts and tagged Asian, Bargain Meal of the Week, Easy Recipe, Fish and Seafood, Make Ahead, planned leftovers, Salmon, Sesame Seeds, snow peas, Special Occasion. Bookmark the permalink.